This fella is a wealth of knowledge, and a mileage-driven backpacker! Every once in a while, a slow hiker (me) runs into a guy that's planning an unsupported, ZERO-RESUPPLY end-to-end of the Long Trail... He's got some more Pemi red-lining to do in the meantime! Nice camping with a legend! ZERO-RESUPPLY TRIPS ARE WHERE IT'S AT!!!! Nice photo. I like the old timers a lot. I eagerly await this trip report. 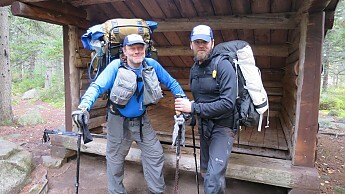 Sean's Going to do The long Trail with no resupply? Nice how long has it been since someone has done that? Ha Denis I misread this at first also! Sean, Did you guys meet by chance? LS, how in the world will you fit that much food into/onto that external frame pack? We both coordinated this one, through the 'ole Trailspace... LS and I both were technically tagging along with a pal of mine that has been taking trips up to Baxter for close to 20 years. This was a very relaxed trip, which happened to be a nice breath of fresh air... Lots (and lots) of time to cook! Definitely a relaxing trip with lots of time to cook. Many experimental soups were prepared and eaten as the temps were quite cool. Sean had a couple of nice looking home dehydrated soups and I was testing out doctored up Bear Creek mixes. Not a fan of having to wash the pot and bowl, but for cold weather or long distance trips I'm seeing it is worth the effort. Swilling hot and tasty stuff makes for a happy tummy. As for the unsupported LT I'm working on setting a record for the slowest time not the fastest :) Patrick is right, getting all the food loaded up is the biggest challenge. Then the hard part is eating it instead of walking into town for a burger and beers. Previous experience has taught me that around day seven I begin to become obsessed with the thought of fresh meat. Along with stronger legs this folly will require stronger will or cannibalism is a serious risk. Previous experience has taught me that around day seven I begin to become obsessed with the thought of fresh meat. Along with stronger legs this folly will require stronger will or cannibalism is a serious risk. Its usually around day 5 for me! Hope you do a trail report on this adventure LS. How can you do a long trail without resupply? The folks who usually do it go very fast and don't carry much food. FTK for unsupported LT is less than a week, but that guy was hallucinating for the last day or so due to lack of sleep and exhaustion. I can't do that. The only way I can do it is to go slower and carry more food. In negotiations with Seek Outside on a customized Unaweep right now. Had been targeting 40 pounds of food for three weeks of hiking, but from what I hear this pack may allow me to start with more. I have a two week, ~190 mile, test trip planned for June from Stratton to Katahdin. That should give me a better idea of how my strategies hold up over time. Like I said previously, the hardest part will be staying on trail when everyone else is getting off for beer and cheeseburgers. The rest of it is just a long walk. Yeah, I've been pulled off the trail with thoughts of steak fajitas. Then, after sitting in a heated room, with a belly full of nacho chips, it becomes really hard to get back on the cold trail with dehydrated food. This is one place where the new style of backpacking falls apart. Bringing a fishing rod and/or a .22 pistol can change everything by supplying nutrients that your body needs. What's old is new again. I will never forget the two brothers I met a couple of years ago hiking the PCT and foraging for their food as they went. There is something peculiar about leaving the trail every 5 days to gorge on food in town after a week of bars and Top Ramen noodles. It breaks the rhythm of being out there and is dishonest somehow. I applaud people like Walter that go out there and stay there. If I ever do any long trips I am bringing a donkey or at least a couple of llamas. Sweeping snow has given me one more insight as to what is wrong with re-supply. People have a schedule. That is what I am always trying to avoid. Having to be somewhere at a certain time, or calling with a phone to arrange a meeting or a ride. A cache is better, but then there is the uncertainty of being able to find it, and whether it is still intact or not. Being self-sufficient avoids all of these problems. I am going to predict that eventually people will start to focus more on food procurement on long trips and using friendly pack animals like llamas and donkeys. Then they can eat real food, not worry about a schedule and not have to run to a town every 5 days. This is exactly how people used to travel worldwide for centuries, leading pack animals on foot. Has backpacking turned into a trendy under taking driven by social media and movies? or are people going to re-energize the old strategies that worked so well for so long? Backpacking for a long time was the realm of the adventurous and resourceful. Then we got "Outside" magazine and others telling us where to go, what to wear and how to act in the backcountry. The latest round of books and movies has brought lots of newbies into the sport that only know what they see. Maybe it is time for a new movement. Ray Mears is on the right track. People making their own equipment and going simple and light. It doesn't need to cost a lot to be done right. To me this is the important stuff, not what kind of socks to wear. Walter, what do you think? North? Erich? Okay I am one hand clapping again. "How do you do a long trail without resupply?" How do you think the West Was Won?